This is the time of year baking pumpkins are at every store and we are on the hunt for the best pumpkin dessert recipes. We’ve all had pumpkin pie, but that is not the only way to bake this delicious winter squash which is considered a fruit. You can create it into cookies, bars, rolls, bread and more. 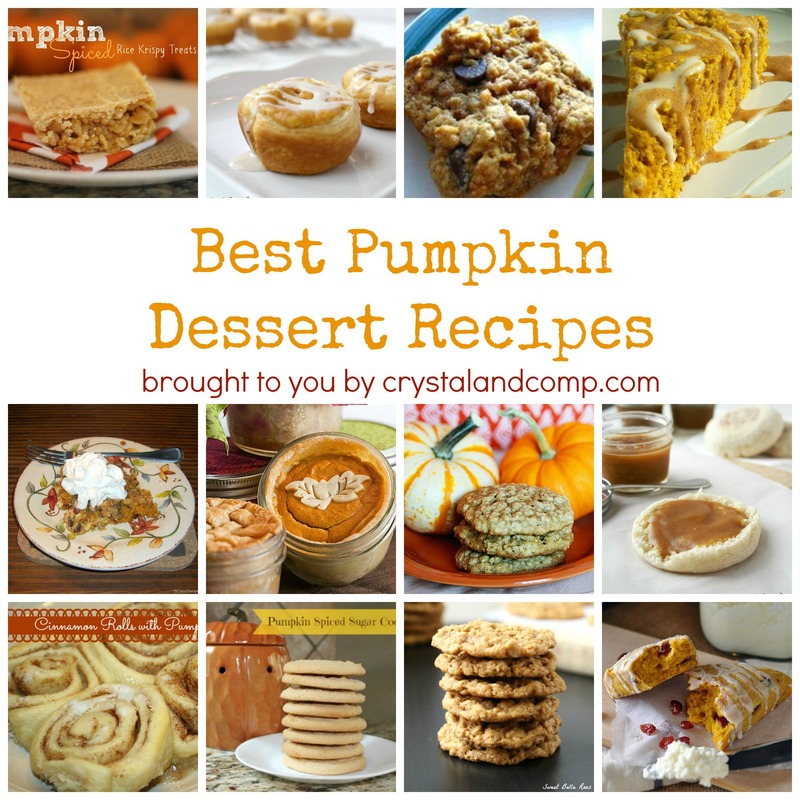 Here is a delicious collection of 15 ways to create pumpkin into a dessert. Which is your favorite? Pumpkin Rice Krispy Treats – the kids would love these. What a fun take on the popular treat. Pumpkin Cheesecake Rolls – these looks delish. Perfect for breakfast or dessert. Pumpkin Oatmeal Chocolate Chip Cookies – I am willing to bet that pumpkin and chocolate chips are pretty amazing together. Pumpkin Scones – yum. What a delicious after dinner treat. Pumpkin Crisp– now this some something my husband would love. Pumpkin Pie in a Jar – take pumpkin pie to an adorable new level. These are gorgeous. Chocolate Chip Pumpkin Bread – huge fans of pumpkin bread at my house. Pumpkin Spice Oatmeal Cookies– another version of the cookie but without the chocolate chips. Pumpkin Apple Butter – this stuff looks amazing and can be used on so many different breads and desserts. Cinnamon Rolls with Pumpkin Icing– give me cinnamon rolls anytime of day. Score! Pumpkin Spice Sugar Cookies – perfect for a school party or get together. Autumn Pumpkin Seed Bread– a great way to utilize those pumpkin seeds. Chewy Pumpkin Oatmeal Cookies – chewy cookies are the best cookies, in my opinion. Pumpkin Spice Cranberry Scones with Homemade Butter – this is almost too gorgeous to eat. Pumpkin and cranberry together are super yum. And this homemade butter…. sign me up! Lumpy Pumpkin Bites– perfect after dinner dessert for a busy week night. Take one of these pumpkin dessert recipes to your family get together and you’ll be the hit of the party. Think outside the pumpkin pie. Want more dessert ideas that stand out. Take one of these Simple Spanish Dessert Recipes to your family gathering. Oh my goodness they all look good, which one to pick? Thanks so much for sharing your great recipe with Full Plate Thursday and enjoy your Thanksgiving week!